Chimpanzees are reputed to be one of Man's closest living relatives, and can still be found in a number of forests in Uganda, Rwanda, Tanzania and the Democratic Republic of Congo. Today, less than 150,000 chimpanzees remain in the wild, with the chimpanzee now listed as an endangered species. Time spent with these amazing creatures is both fascinating and rewarding. Consider including a chimpanzee trek as part of your next safari while it is still possible to watch them going about their daily business in their native forests - wild and free. Chimpanzee sanctuaries can also be visited in Kenya, Zambia and South Africa. 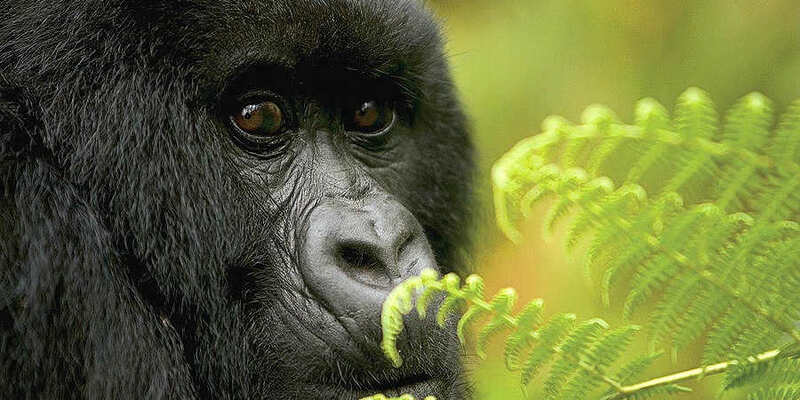 These are intriguing creatures to watch and fascinating to learn about - if you get the opportunity we would highly recommend including one of the locations below in your safari itinerary..
Bwindi Impenetrable National Park is an enduring pocket of a huge primeval forest that once stretched from the Virunga Volcanoes in the south to the Rwenzori Mountains in the north. The fertile 331 square kilometres of the park contain 113 species of mammals (including a herd of the rare forest elephant), 200 species of butterfly, over 360 species of birds and a prodigious 324 tree varieties (10 of which are endemic to the park). In addition to this incredible diversity, Bwindi is home to seven species of primates, attracting the attention of international conservation efforts, of which the most endangered is that elusive giant of Africa-- the Mountain Gorilla. Only 650 of these magnificent animals remain worldwide, and Bwindi is home to nearly half of them. Chimpanzee tracking in Uganda is an exciting safari option - especially at Chambura Gorge and Kibale in the west and Budongo and Kanyiyo Pabidi near Murchison Falls; they are also found in the huge afro-montane forest of Nyungwe in Rwanda. Bwindi is one of the few forests where gorillas and chimps co-exist but here they are rarely seen. The Ugandan and Rwandan variety (Pan Troglodytes Schweinfurthi) is long-haired and lives in those forests where there is a rich, all year round food supply. 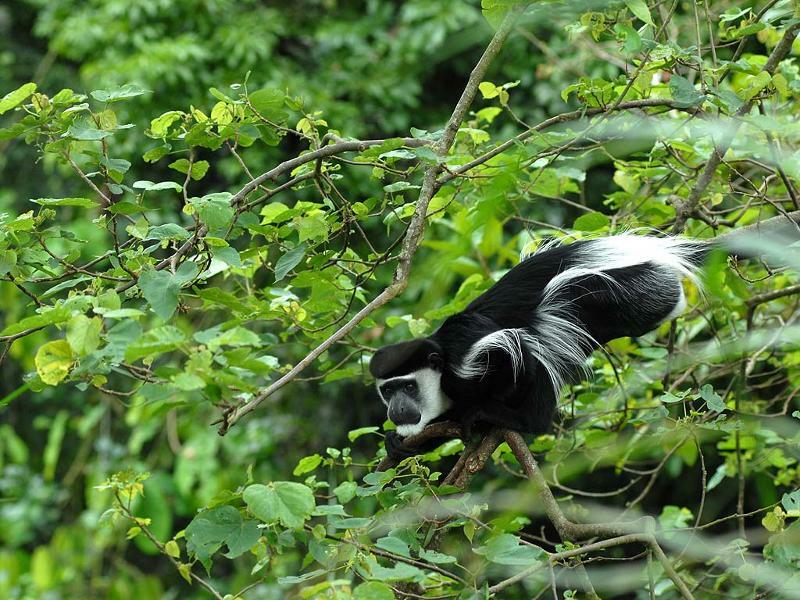 Kibale Forest has thirteen species of primates - among the highest number recorded in an African forest - including the chimpanzee, the vervet monkey and the red colobus. Tracking the noisy chimpanzee families racing through this verdant forest is a thrilling experience. Pabidi Budongo and Kanyiyo Pabidi in Murchisan Falls NP contain one of the most extensive mahogany forests in East Africa, and the region's largest chimpanzee population - about 900 animals. Chimp tracking is available either at Busingiro, in the south of Budongo, or at Kanyiyo Pabidi on the road to Murchison. Ngamba Island Chimpanzee Sanctuary, about a 45-minute speedboat ride from Entebbe, or alternatively 1-2 hours by ssese canoe! This 100 acre forested island provides a safe haven for over 30 orphaned chimps that are now free to roam the island thanks to project leaders Uganda Wildlife Education Centre (UWEC) and other concerned organisations who raised funds for the project. It offers a unique opportunity for close viewing of chimpanzees in their natural environment. Pre-arranged supplementary feeding times (11.00am & 2.30pm each day) bring the chimpanzees to within metres of the raised walkway specially designed for easy viewing. Also available are half day, full day and overnight visits to Ngamba Island. The overnight trips include the opportunity to assist with the bedtime and early morning feeding routine of the chimpanzees. Guests are accommodated in spacious walk-in two man tents, meals are provided and ablution facilities are available. Gombe Stream is a wonderful, remote and spectacularly beautiful National Park which clings to the shores of Lake Tanganyika in Western Tanzania. This is the smallest of Tanzania's National Parks and one of it's secret treasures- a swathe of ancient rainforest forming a fragile and secluded habitat for the world's most famous chimpanzees. The priority here is research not tourism, and a trip to Gombe offers the chance to become one of the privileged few to visit chimpanzees in their natural environment. The chance for some of the most magical game-viewing it is possible to imagine - the opportunity to look deep into the eyes of our closest relatives. There are few natural environments more seductive than Mahale. It is achingly beautiful and unspoilt. Tropical mountains rise up from the pale sandy beaches of Lake Tanganyika, rivers tumble down waterfalls to the shoreline, through fairy-tale forest valleys, providing stunning hiking terrain. Over 90 unique species of fish swim meanwhile in the gin-clear waters of the lake. The Mahale Mountains rise on the far western border of Tanzania, some 90 miles south of Kigoma. Arusha is 540 miles to the north-east. This is absolutely the best place in the world for tourists to view wild chimpanzees, and staggeringly beautiful besides. The Mahale Mountains lie on Lake Tanganyika on the far Western border of Tanzania. The park is 1613 square kms, rising up from the lakeshore through tropical forest to 2462 metres (7500 feet) at Nkungwe Peak. It is home to nine species of primate, including some 700-1000 chimps, forest antelopes, leopard and a great variety of birds and butterflies. There are no roads or cars for fifty miles. Getting there is by boat or on foot! "...Mahale's grand scale, isolated character, magnificent scenery and idyllic beaches make it a rewarding wilderness destination on any level." Philip Briggs, Africa Geographic. The Virunga National Park / Parc National des Volcans (PNV) in northern Rwanda is home to the endangered Mountain Gorilla. The gorillas live in a protected area, free from poachers and can be viewed in their natural mountain habitats at fairly close range. Parc National des Volcans (PNV) consists of 125 sq Km of mountain forest and is home to the six Virunga Volcanoes bordering DRC and Uganda. Best known for its mountain gorilla inhabitants, what is now the PNV was originally part of the Albert National Park, one of the earliest national parks created in Africa, established in 1925. It is the National Park in which Dian Fossey did her groundbreaking studies into mountain gorillas before her murder in 1985. This work was exposed to a mass-audience in the film Gorillas in the Mist released three years after her death. There are currently five habituated families of gorillas in PNV and gorilla tracking is the main reason most tourists visit this area. Apart from the gorillas, the Park is also home to seventy six mammal species, including a troop of habituated golden monkeys. Nature walks can be undertaken alongside a knowledgeable National Park's guide; climbs of the volcanoes are also possible as well as visiting the tomb of Dian Fossey. Today, the Park is managed and protected by the Rwandan Office of Tourism and National Parks (ORTPN). Access to the PNV begins in the lively town of Ruhengeri, situated at the base of the entrance of the park. Ruhengeri has long been the base point for gorilla visits and entertains a stunning backdrop of Karisimbi, Visoke, Mikeno, Sabyinyo, Gahinga and Muhabura volcanoes. Ruhengeri is easily reached from Rwanda's capital city, Kigali, and is also only a 45-minute drive away from Gisenyi and the stunning Lake Kivu. A 200-acre Chimpanzee sanctuary has been set up at Sweetwaters Game Reserve. A visit to this Sanctuary and the 30-minute boat ride (subject to fine weather) on the river among the chimps is available to all guests at Sweetwaters Tented Camp and attracts no extra charge. The aim of the project, initiated by Lonrho East Africa, Kenya Wildlife Services and the Jane Goodall Institute, is to set up a colony where chimps can be introduced, rehabilitated and taught to fend for themselves in an area similar to their natural living conditions. Priority is given to orphaned and abused chimps. The Sanctuary currently has 24 chimps, including two babies born in the Sanctuary. On the headwaters of the Kafue River, sixty kilometers west of Chingola, lies the Chimfunshi Wildlife Orphanage - now home to over fifty chimpanzees housed in two enclosures - one walled and the other solar power electric fencing - with cages for the new introductions. But Chimfunshi is outgrowing itself. Plans for the acquisition of more land have developed into the formation of the Chimfunshi Wildlife Orphanage Trust. The Trust has purchased a neighbouring farm of ten thousand acres. the intention is to create a 2500 acre fenced enclosure for the chimps while the balance will be dedicated to a wildlife preserve, education facilities and a tourist lodge. Set on a 1000 hectare game reserve, JGI Chimpanzee Eden is a home to chimpanzees that have been misplaced from their natural habitat. The world renowned Jane Goodall Institute has made this tranquil venue their South African sanctuary and has committed itself to the rescue and care take of chimpanzees in need of refuge. Being the 1st and only chimpanzee sanctuary in South Africa, this venue will be able to bring the world of chimpanzees closer to humanity through education, tourism and modern technology. Entering the reserve, a mere 15 km from the bustling city of Nelspruit, visitors can expect to be captivated by the beautiful bush surroundings with most of the natural game species roaming the reserve. The reserve is also located in a low risk malaria area. The goal of the Sanctuary is to rescue some of the Chimpanzees that have survived the hunting ordeal but are still misplaced through the lucrative illegal pet trade to zoos, circus performers and medical research facilities. Besides being provided with a home to live out their lives they are also provided with the necessary attention to recover from the trauma that they have experienced. Visitors will have a unique opportunity to see Chimpanzees in semi-wild surroundings with normal social interaction and behavioural patterns under group members. The Chimpanzee groups live within large semi-wild enclosures that are close to their natural habitat. The enclosures also have viewpoints overlooking the forest and ‘foraging areas'. The ‘foraging areas' have small fruits and berries mixed in Eucalyptus Tree leaves. These ‘foraging areas' will provide the Chimpanzees with behavioural enrichment and will also provide visitors that arrive after the feeding time with a better chance to view them in the large enclosures.